New Orleans Public Belt Railroad (NOPB) held its second Neighbor Open House the evening of Dec. 6, 2018, at the New Orleans Center for Creative Arts (NOCCA) in the Bywater neighborhood. The event was attended by dozens of community members who came to learn about rail operations and share their ideas and questions with NOPB staff. The Urban Rail Initiative is a company-wide program that addresses infrastructure improvements, operations practices, and internal and external outreach. The purpose of the initiative is to improve community relations while increasing fluidity across the network. 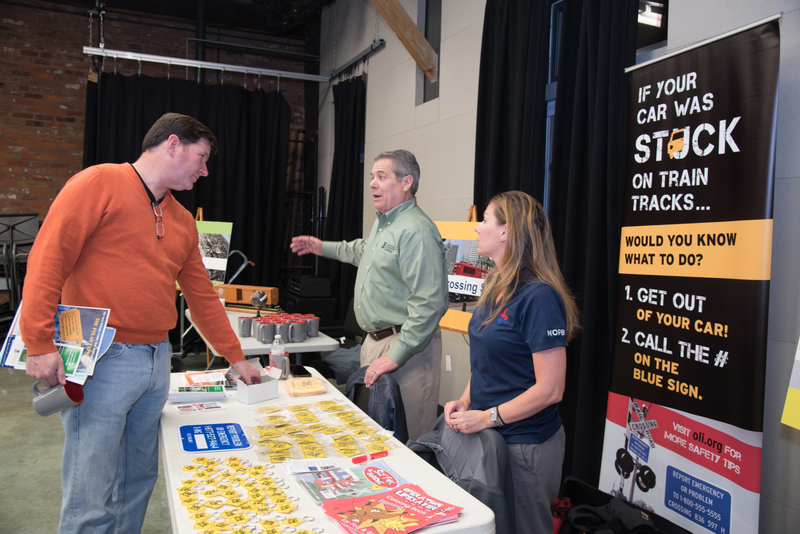 In line with those goals, the neighborhood event was designed with an open format, with tables addressing rail safety, NOPB history, quiet zone information and more. An NOPB team member was ready at each table to address any questions neighbors had. Partners including The New Orleans Department of Homeland Security and Preparedness and Operation Lifesaver also had tables at the event. To share the holiday spirit with the community, NOPB is bringing back its holiday movie and train event featuring “The Polar Express” on Thursday, Dec. 20 at 6:30 p.m. at the NOPB Engine Terminal located at 4822 Tchoupitoulas St. Popcorn, soft drinks and hot chocolate will be served and a special appearance by Santa is planned as well. Attendees are encouraged to wear their warm pajamas. Carpet floor seating is provided and guests may bring folding chairs if they prefer. The event is free, but space is limited. Advance reservations are required and may be made by emailing neighbors@railnola.com.